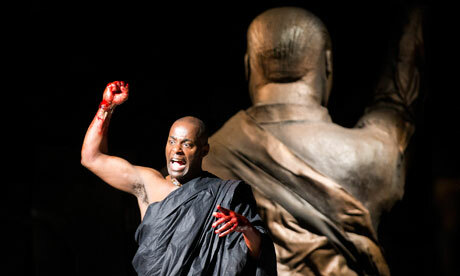 Transported from Ancient Rome to present-day Africa, Shakespeare’s political thriller gains in the more obvious political relevance and loses some of the thrills. Gregory Doran’s production gets off to a lively start with the huge cast celebrating onstage as the audience comes in. The mood is broken by the arrival of soldiers to subdue and police the crowd. Julius Caesar is awarded unprecedented powers by the senate but not everyone is in favour. A group of conspirators plot and carry out his assassination only to find the tide of public opinion turns against them. They are hunted down. The main players commit suicide to avoid capture. That’s the plot in a nutshell. What the play is about in my view is the persuasive power of language. People are always talking others into or out of doing things. Shakespeare’s masterstroke is the famous speech by Mark Antony, whose rhetoric is irresistible. Unfortunately, I found Ray Fearon’s muscular Antony a little too mannered in this speech, leaning on the accent rather than the words. He may as well have been singing to the mob. A shame this, in an otherwise impressive characterisation – he built the “Cry havoc and let slip the dogs of war” speech to a perfect crescendo. Jeffrey Kissoon as Caesar is a charismatic, avuncular dictator, comfortable with his status. The audience knows that those he holds nearest are up to no good and the tension of expectation leading up to the assassination is nicely built. From then on, the production becomes patchier. There are some moments and strong touches (I liked the Soothsayer as a shaman/witchdoctor figure, looming over pivotal scenes) but the action becomes muddied. The corpse of Caesar is like a bag of washing that has been run over – Wisely, the mob conceals it from view. Paterson Joseph’s Brutus is a complex character – a mix of strong-jawed political conviction and wet-eyed sentiment. His relationship with young servant Lucius (Simon Manyonda) brings humour and warmth – the image of boys with firearms is all too familiar from media coverage, although I suspect their allegiance to the local warlord is born of something other than filial affection. Manyonda stole the show, proving you don’t need the showcase speeches and the spotlight to create an affecting, rounded and beautiful performance. The set is mainly stone steps, worn and chipped, dominated by a humongous statue with a fascistic salute. Of course, the statue is toppled – it’s Revolutionary Symbolism 101, but I felt disengaged long before this point. I didn’t care that the conspirators had failed. I didn’t care that they had been caught. The pertinence of the play – the transitory nature of power – shed no new light on current situations. I suppose I wanted to be startled into realising something. I wasn’t. And two-and-a-half hours without an interval is too long a time to sit in those RST pews.